"This is dedicated to all those chefs who tell you to never, ever mix fish and cheese together; and yet there they are, at the diner at 2:00 in the morning. And you know what they eat? 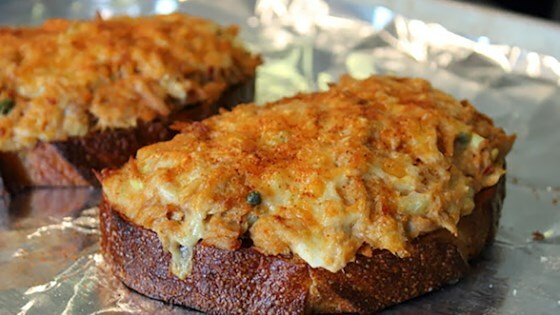 Tuna melts. And the reason they do is because it is delicious." Place tuna into a mixing bowl and lightly break apart with a fork. Add green onion, celery, capers, chile paste, and mayonnaise. Pinch small pieces from mozzarella cheese into the tuna salad and stir to mix. Season with salt and black pepper; refrigerate tuna salad until needed. Heat oven's broiler. Line a baking sheet with aluminum foil. Spread butter generously on both sides of French bread slices. Broil buttered bread until golden brown on top, 2 to 3 minutes. Flip bread slices and broil other side until toasted, 2 to 3 more minutes. Remove from oven and turn bread slices over on the baking sheet so the darkest sides are on the bottom. Gently spread tuna salad onto bread slices using 2 forks. Press the salad onto the bread and spread tuna all the way to the edges of the bread. Spread shredded sharp Cheddar over each sandwich. Dust tops with cayenne pepper. Place sandwiches under broiler and cook until cheese is melted and bubbling, 5 to 6 minutes. Use a baking dish underneath your sheet pan if you need to move your food slightly closer to the broiler flame. These were very good and we will make them again. Used horseradish cheddar and the mozzarella was shredded, instead of pinching it in bits.